STUDIO CITY, CA – JANUARY 28, 2019 – In the “When Calls the Heart” season six premiere “Phone Rings and Heartstrings” Sunday, February 24 (8 p.m. ET/PT) on Hallmark Channel, the town of Hope Valley adjusts to the changing times – while still maintaining the small-town bonds that connect them. 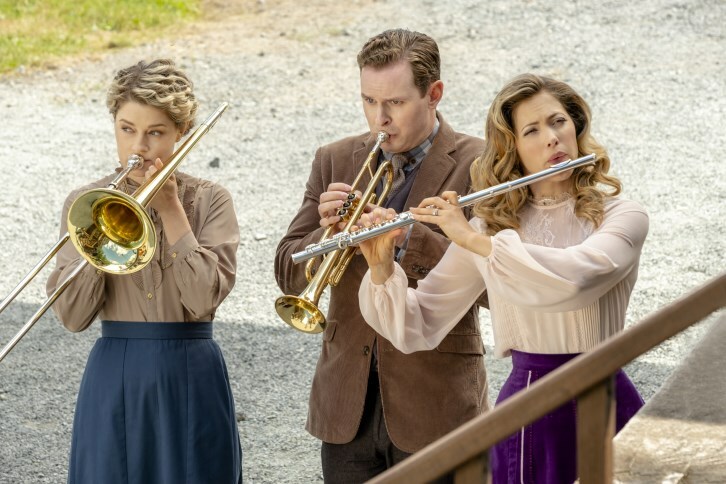 After taking time off to care for her new baby, Elizabeth (Erin Krakow) returns to teaching but soon realizes she needs more support than she could have imagined. Abigail (Lori Loughlin) prepares for the arrival of the telephone to Hope Valley. Bill (Jack Wagner) and Gowen (Martin Cummins) enter a bidding war for the town saloon. When Rosemary (Pascale Hutton) senses a spark between Faith and Carson, she fans the flames trying to get a romance started. “Phone Rings and Heartstrings” was written by Alfonso H. Moreno and directed by Neill Fearnley.